EAGLE — Eagle Police Chief Joe Staufer has seen his share of emergency situations during his law enforcement career, but during the early morning hours Tuesday, he was part of an experience he will never forget when he delivered his baby daughter at Mile Marker 140 of the Gypsum Interstate 70 exit. The series of events that led to the roadside delivery started in the wee hours on Tuesday. Staufer and his wife, Vio, had been to Valley View Hospital on Monday where staff predicted their daughter would arrive some time during the next couple of weeks. The chief went to bed earlier in anticipation of a busy Tuesday at the Eagle Police Department. However, shortly after midnight, Vio woke him up to say her contractions were coming seven minutes apart, so the couple set off for Glenwood Springs. However, by the time they had gone 7 miles down the road, Vio’s contractions were coming 20 seconds apart. Staufer decided to exit at Gypsum and head to the fire station. But their daughter was in a big hurry. When Staufer heard his wife scream “I think I feel something, I think it’s the head!” he pulled over to make an emergency 911 call. 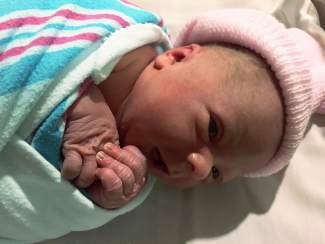 Kelly Klein of Vail Dispatch offered his assistance and less than one minute later, the chief and his wife welcomed their new daughter to the world. With prompting from Klein, Staufer made sure his daughter’s airway was unobstructed an the umbilical cord was tied. He wrapped his daughter in a jacket and then emergency crews arrived on the scene. Mom and daughter were then transported to Valley View Hospital via ambulance. “While first aid and patient care skills are routinely reviewed by police, delivery of a baby isn’t typically part of that routine and wasn’t something I had reviewed in nearly 19 years. We had a crash course last night,” Staufer said on Wednesday. Staufer noted that while Interstate 70 has held some unfortunate memories in his career, Mile Marker 140 will always have a special place in the heart of his family, friends and his first responder team. By Wednesday, mommy and daughter were resting well at Valley View Hospital as the Staufers mulled over a first name for their daughter. Her middle name has been decided, and it is “Jade.” And although it was suggested, the offer to name her “Gypsum” didn’t pass the mommy muster.